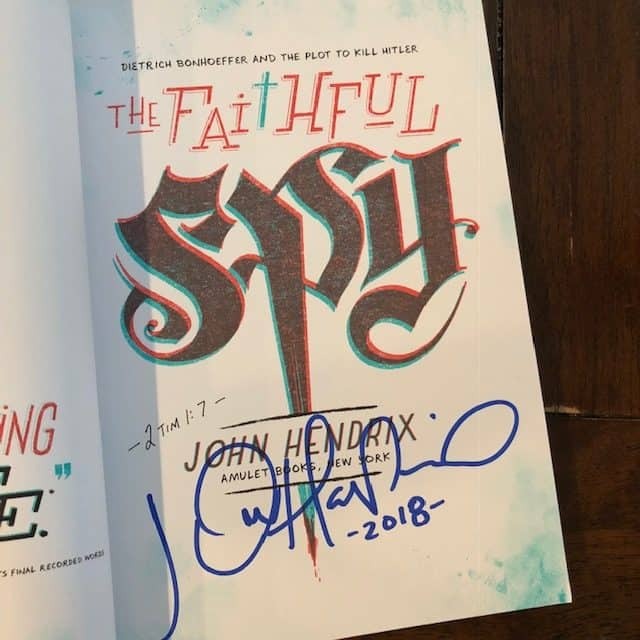 I was super blessed to get to meet John Hendrix this past weekend at Hutchmoot… AND he was gracious enough to sign a copy of The Faithful Spy which you can enter to win at the end of this post! Up until now, John Hendrix has primarily worked as an illustrator, but the writing is solid and even beautiful in places. Bonhoeffer, a German theologian, lived in Nazi Germany during World War Two. Hendrix details how Bonhoeffer’s experiences abroad and his theological questions spur him to action on behalf of his beloved Germany and “the other.” Bonhoeffer’s view of the church plays a central roll in his story. His deep convictions caused him to join the Nazi government as a double agent. As a member of the Abwehr, he helped Jews escape the country and plotted to kill Hitler. Art–I’ve always loved Hendrix’s art. Each word of this book is hand lettered. 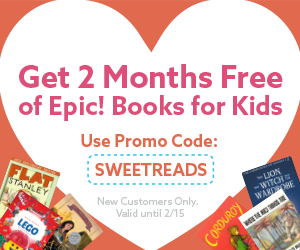 (Some are very tiny for adults, but most kids shouldn’t have a problem reading it). Hendrix masterfully uses color to set mood and indicate the two opposing forces. Blue stands for Bonhoeffer and good. Red represents for Hitler and evil. Connection–Hendrix challenges his readers to think about their own treatment of “the other” in their lives. Inspiration–Certain sections of this book were so beautiful they gave me chills–particularly the ending. Accessibility–The format of this book makes it appealing to visually oriented kids who might not otherwise have the patience to read a biography of this length. The Faithful Spy tends more toward illustrated biography than graphic novel. 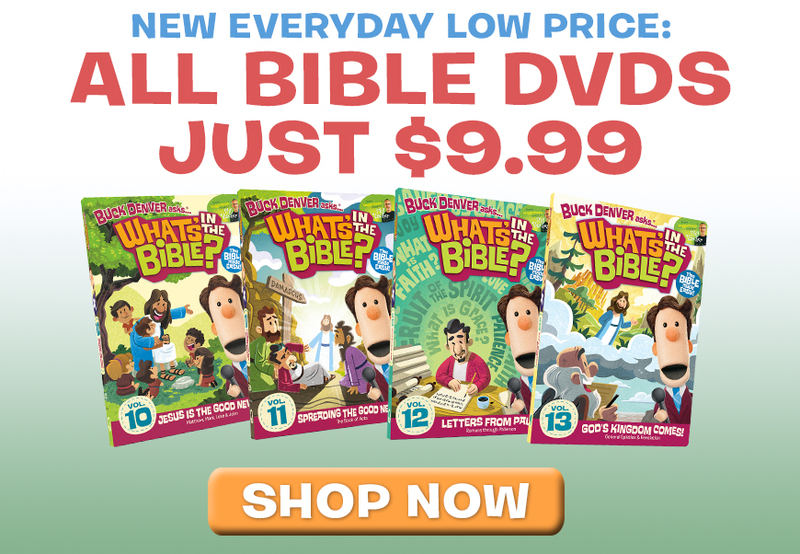 Because of this, the text in places is dense and best suited for ages ten and older. Bonhoeffer’s story takes place during the same time as the Holocaust. Though Bonhoeffer’s actions were partially motivated by Hitler’s treatment of the Jews and other groups, the book does not detail the atrocities of this period. Hendrix explains that he limited himself to what Bonhoeffer encountered. This helps keep the text age appropriate. I’d encourage you to check out Hendrix’s non-fiction picture books Miracle Man: The Story of Jesus and Shooting Stars: The Christmas Truce of 1914. 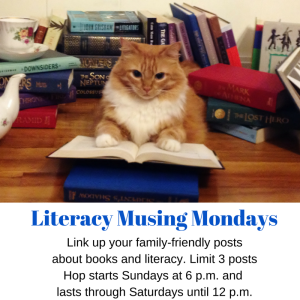 Whose biography would you love for your kids to read? I have this book on my 8-year-old son’s wishlist — he might be a little young, but what a great story and illustration for him to grow into. Thanks for your review and giveaway. Love the concept of this book! I’ve only recently been following John Hendrix work, but it’s phenomenal. We used to have the “Heroes of the Faith” book series when I was young, but I’m such a visual learner. I’m sure this will go on to be a huge success among readers of all ages. Ive always been intrigued by Bonhoeffer since I listened to the focus on the family radio theatre episodes about him. Would love this book for my almost 10 year old! Ooo, I didn’t know Focus had a radio theatre about him! What ages would you recommend it for? I was a teenager so I’m not exactly sure. Off hand I’d guess 12+? LOve this! 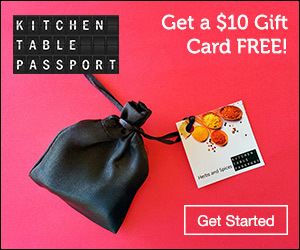 i would have never heard about it except for you-thanks! Also, I thought I knew the author’s name from somewhere!!!! Shooting at the Stars is on our Christmas reading list every year-great read! Excited about something for my older ones! I’m so excited to see your recommendation for this! I have a 9YO who thinks he’s a spy (shhh!, don’t tell anyone) and I have this on my wish list to get for him. I’d love to win it instead! This book sounds fascinating! Thank you for the review. I’ll be sure to check out more of John Hendrix’s work. I’d love for my son, 7, to have this book to grow into. Bonhoeffer was an amazing man. I’ve read one biography, but that was years ago. I love learning about Bonhoeffer and this style reminds me somewhat of Nathan Hales books, which my daughter lives. I love Hendrix’s work and would love to win! I’ve been intrigued by Bonhoeffer, but that biography in the adult section is a bit intimidating. Seems like this book might be a great place to start. I recently learned there is also a short version of the Metaxas biography. 🙂 This one is fantastic, though. Excited about this book! We are studying this time period next term, so it would be a great addition to our list! Thank you for the giveaway! Very cool! Didn’t know this even existed. I love Bonhoeffer’s story. I would love to share it in beautiful-book form with my daughters. Thanks! I can’t wait to read this and his other books. Thank you for the review and recommendations! Hi! I love it that you went to Hutchmoot. It’s amazing! It is amazing! This was our second year, and we hope to make it an annual tradition. Sounds like an awesome book! Thanks for the giveaway! This book sounds so intriguing. I am finishing up TheBook Thief, and this Bonhoeffer book seems like a great next step! Thank you for your reviews and suggestions. Oh, this looks awesome! My 10 y.o. would love this! I’m putting all 3 of these books on his Xmas list! This looks like something even my husband would enjoy! So happy about this post. I didn’t know about this. My daughters would love it. I read the Mextaxis book and woukd love a way to transmit this story to my kids.